We have a trip to Singapore coming up. It's how we cope with winter here in the mid-west: escaping to the tropics and eating and swimming ourselves silly. Exciting, but the preparation for the trip is always deeply unpleasant because of the sewing. The stores in Minnesota don't really stock summer clothes until it's too late to buy them. So I sew them. 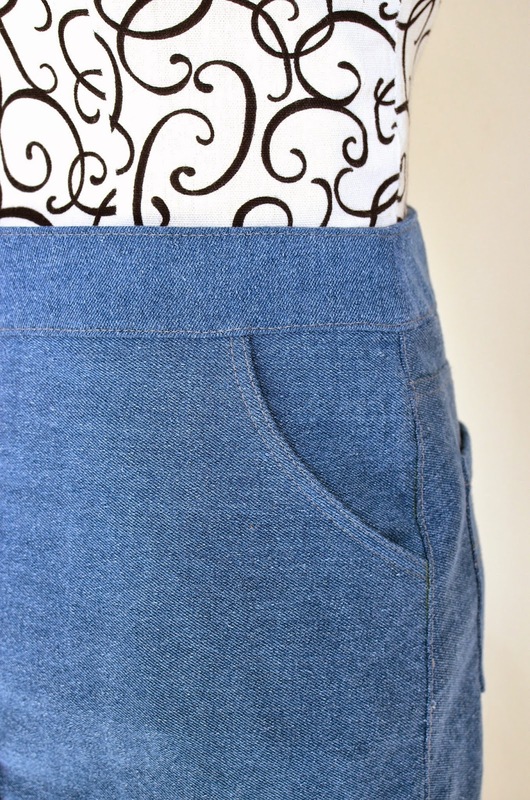 And much as this blog is full of my sewing adventures, I really actually don't like sewing. Especially sewing on a deadline. Have I said that before? Sorry- the long winter has made me belligerent. Anyway. So I've been sewing - for me, for the kids, and maybe even for the husband (but it's not clothes, thank the stars). 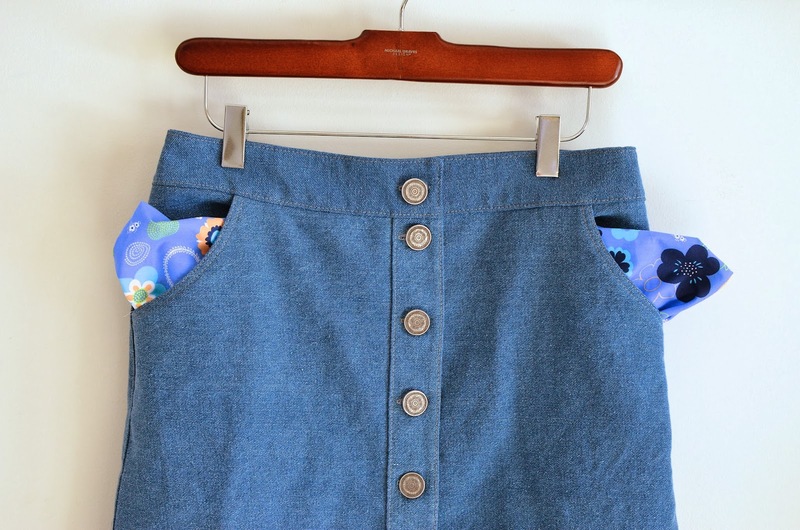 I made this denim skirt just before I put the machine away for its own vacation, the poor overworked thing. 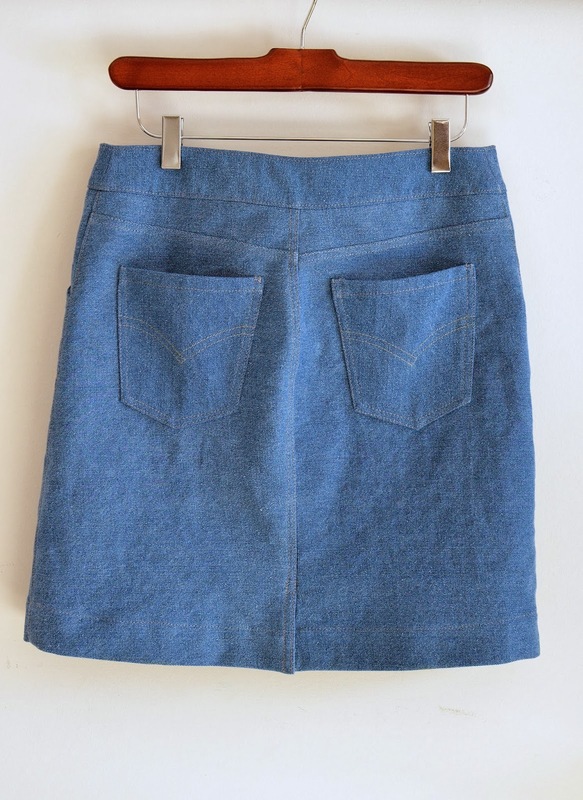 I already have denim skirts. Like this one and this one. That I sewed. But I can't wear them anymore. They don't fit. Apparently, I have shapeshifted again. 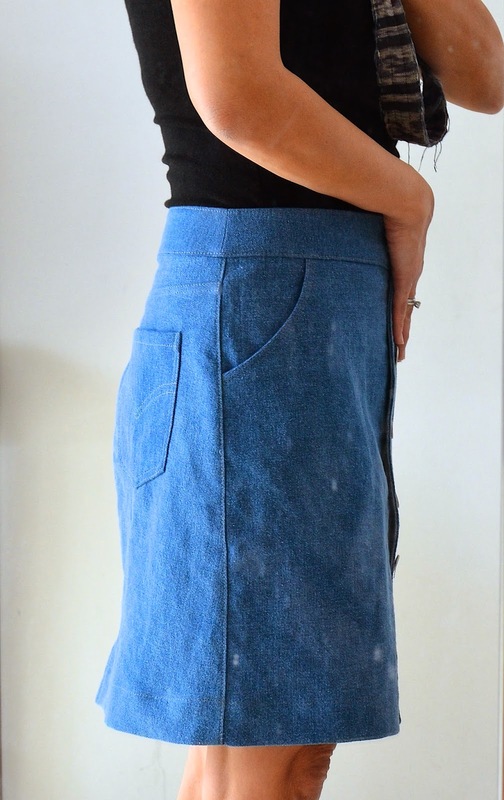 I thought I'd just make a plain Jane skirt this time, instead of fancy panels and godets and what-have-you. This was random denim I found in the remnant pile at the fabric store. I hate the shade of blue because it is too bright to really go with anything but black and grey. If only this were the real shade of blue. So much more chic. But it isn't. 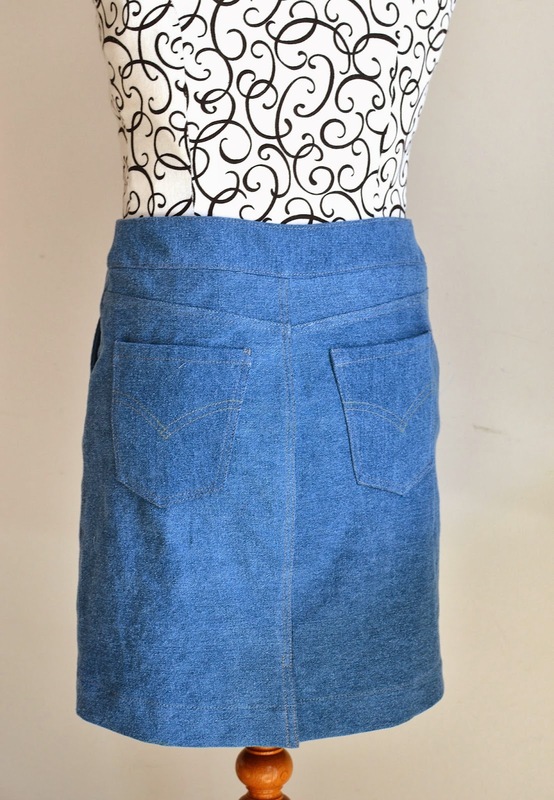 Maybe if I washed this skirt 100 times, it would fade to something nice. And in the meantime, have everyone in Minnesota and Singapore wear sepia-toned glasses so that they'd see this better shade on me. Yes, let's make the world revolve around me, why don't we? Dang this winter. Also, I made the mistake of not using more powerfully-contrasting topstitching thread. Why? Because that grey was what I had and I didn't want to go shopping, and I refused to use the common brown topstitching thread because it would make the weird blue even weirder. 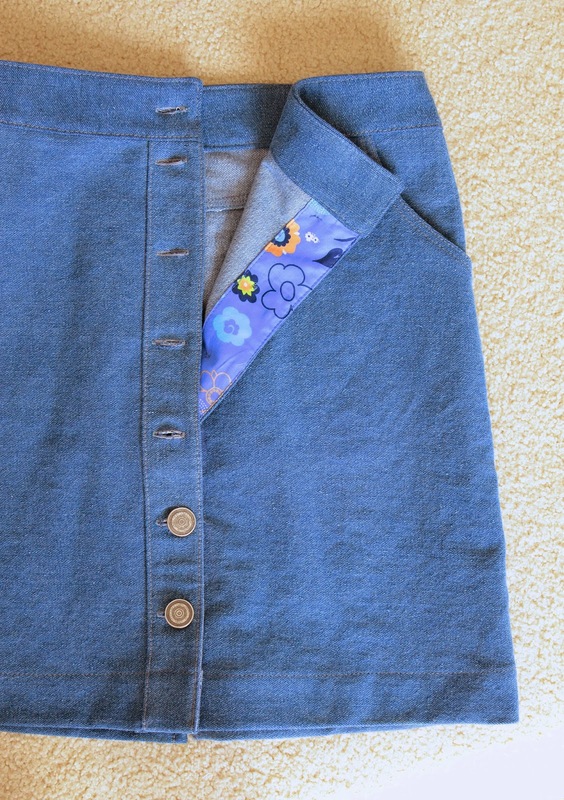 and the button placket facing. As far as deconstructing the skirt goes, there's nothing interesting about it, drafting-wise. The only thing worth mentioning, I guess, is the absence of back waist darts. I thought that if I included them (and I must, in order to shape the back), they'd make a mess of that yoke, and disappear into the pocket and everything. 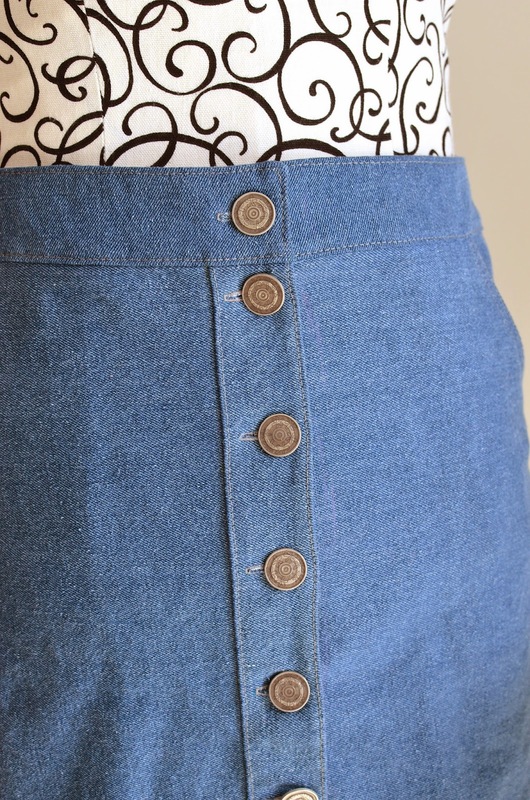 So I moved the waist darts to the center back seam and shaped that, instead. And there's also a back slit. 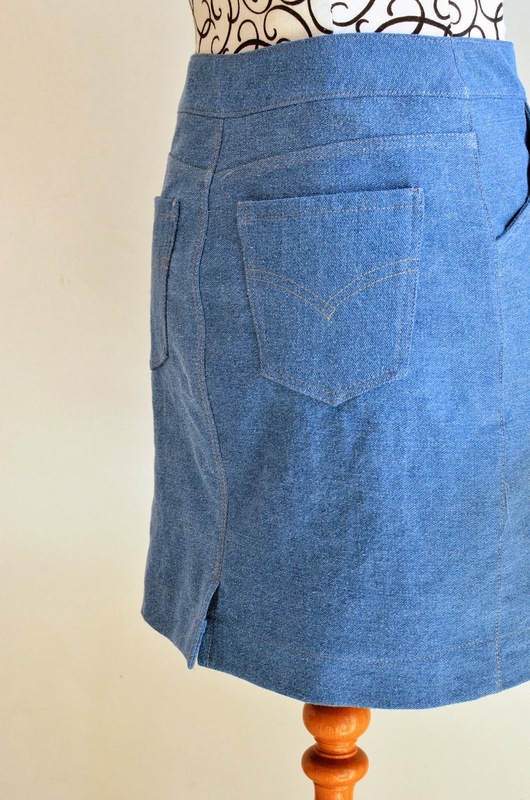 It's been so many years since I'd made a garment with a back slit that I'd forgotten how to do the center back seam SA in order for the slit to overlap and still be serged. 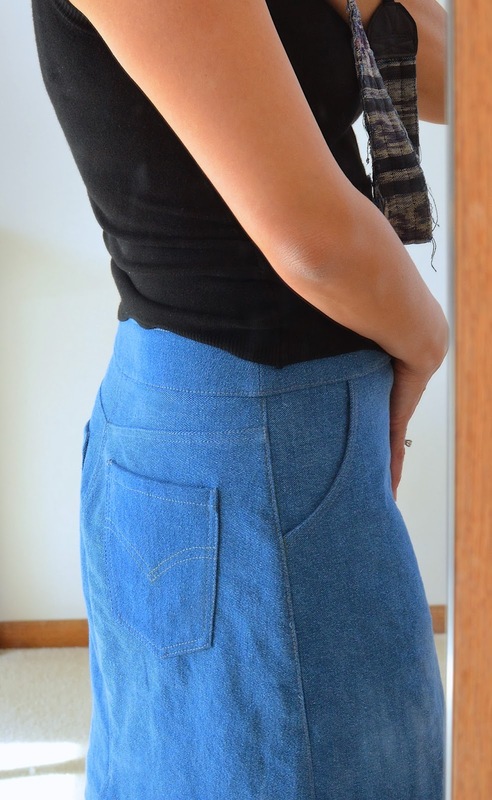 Had to find another RTW skirt with a similar slit and re-acquaint myself with the sequence. Funny. And those buttons are just metal ones with some floral detail on them. I'll show you the kids' stuff next. Mostly strappy knit tank dresses and lycra gym shorts to wear underneath. Happy summer colors, all in the shades we want, sepia glasses optional. Well, we can't change Fleur. But since I made her, I'd shapeshifted in the uh... more robust direction (thanks, Nutella). So now that I'm shapeshifting closer to what she is, and passing her by slightly, it's not that different. She just wears her skirts lower or higher on her hip depending on what I've morphed into at any given time. Hurrah for slanty hips! Monica: I DID! We went for a walk around the block. Like as if it were summer. And days before that, when the weather was 30, the neighbors were out playing catch on their driveway! What an amazing fit. 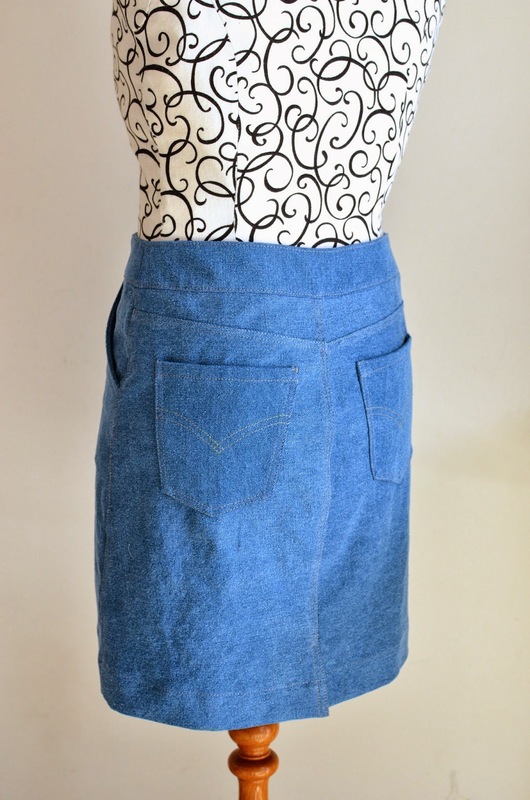 I hope you have many lovely, happy hours in this skirt on your upcoming trip to a warm and colorful place I can only (and just barely) imagine. Actually I thought you had lost weight and that was why your older clothes didn't fit. I guess that's the benefit of well-fitting clothing! You clearly need to make a stop in California on your way to Singapore, and stock up on clothing on your way over! 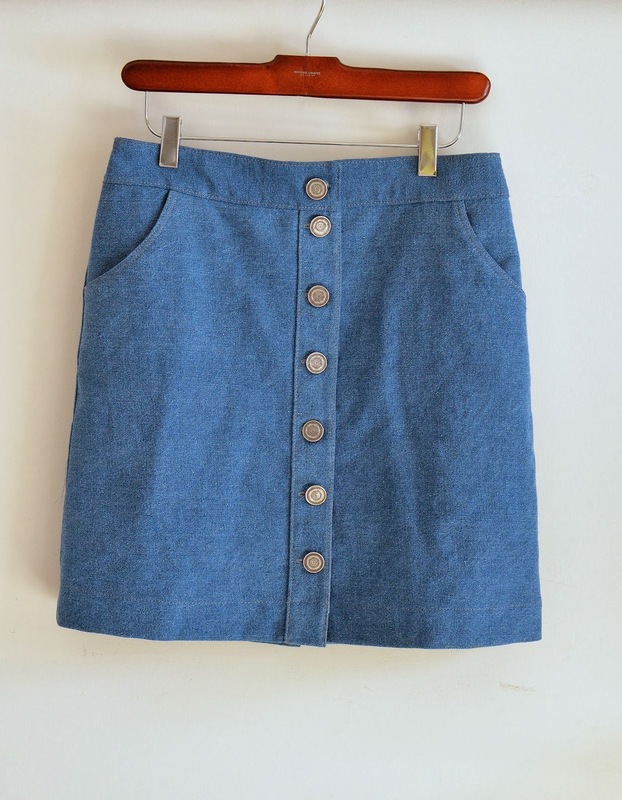 This skirt is lovely. I particularly love the details you have sewn into it! So cute! 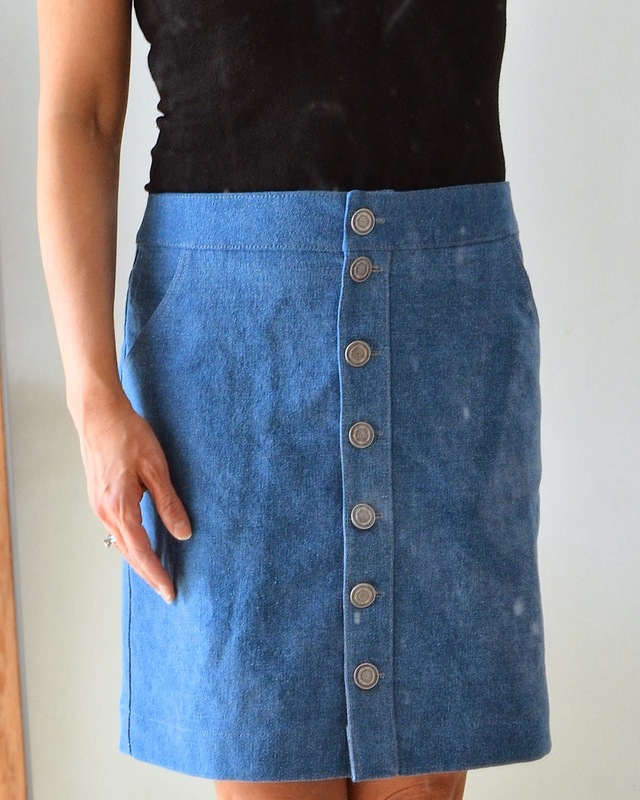 I was just trolling thrift store recently for a simple denim skirt. NEVER occurred to me to sew one. I really like that shade of blue as it shows up on my monitor. You know, you could tea-dye or overdye with some tan or brown dye if you really wanted the sepia tone. But I have a feeling you were just complaining :) A long winter can do that to anyone. 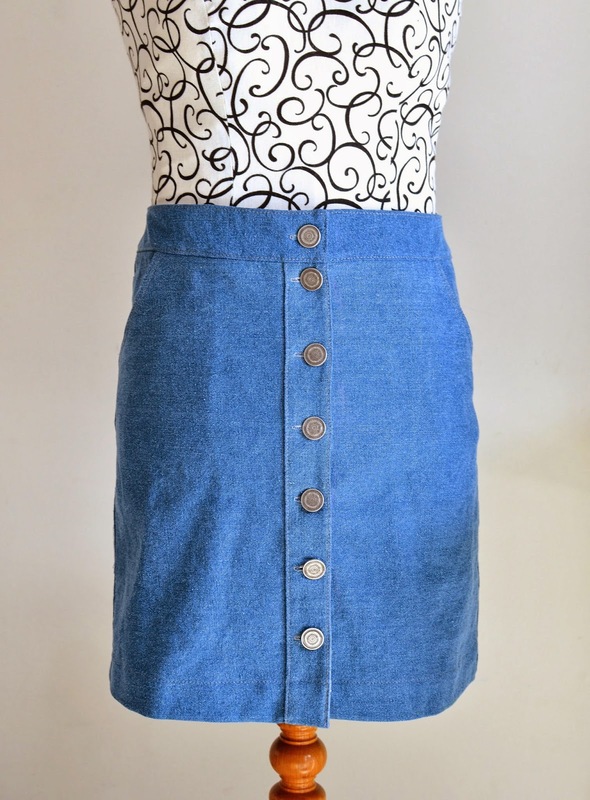 Really cute skirt. Have you tried out rit dyes? I see them in pretty much all the grocery stores. Their website even has a color blending thing so you can make custom colors by mixing and matching. My friend just throws the fabric and dye in the washing machine to dye. Could maybe get a slightly darker blue that way. As it is though, the skirt is super flattering on you.